The third session on 4 July considered aid effectiveness, harmonization and alignment among donors. 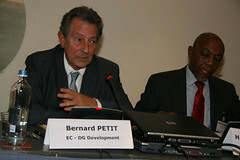 Likening aid harmonization to a jigsaw puzzle, Bernard Petit, Deputy Director General for Development at the European Commission, argued that aid donors, between them, provide developing country governments with many ‘pieces’ of assistance (Tanzania alone has at least 600 health projects each year). However, it is almost impossible for anyone to see the entire picture of the finished puzzle. Donors’ own efforts at monitoring and conditionality – to build up their own pictures – often do not help. 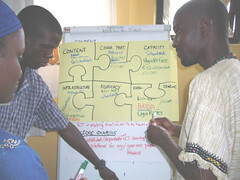 They sometimes conflict with governments’ national strategies; in Kenya for example, 20 donors use at least 13 different purchasing agencies, by-passing the official government purchasing agency; and when a country fields up to 800 missions a year, day to day implementation of development projects is often held back. Through a little more coordination at country and international levels, the picture on the jigsaw puzzle could be clearer to all, and all the pieces can perhaps be found and fitted in their correct places. It has introduced a ‘code of conduct’ that encourages donors to take account of national plans and ensure coherence with the efforts of other donors. The second approach is to encourage a division of labour so that a lead donor is assigned for each priority sector in a country. The role of the ‘lead’ donor is to be a single donor interlocutor on a sector with the national government, rather than having each donor build its own communication channels with, for example, each line ministry. The idea is that European donors are each limited to 3 sectors in a country, that one European donor leads dialogues in one sector, that donors should not rush to their favourite countries, and they should not neglect fragile states. By way of background, Mr. Petit highlighted the challenges the donor community faces today to match the promises made in policy statements with actual practice on the ground. Many donors have achieved the increased volume of development aid they promised by canceling debt. The challenge now is for European governments to find the budgetary means to meet the continued commitment, and also to ensure that aid is more effective and efficient. Over his 36 year career with the Commission, Bernard Petit has seen aid terminology change and evolve in response to the latest ‘fashions’ – but what has actually changed on the ground? Diversification: Change the uses, not the crop!